Coming to a new Judas Priest live album for review is difficult. My prejudice gets the best of me as I'm still, and always will be, a huge fan of Unleashed In The East. 2005's Rising In The East DVD comes close only because it includes several songs from Angel Of Retribution the first album with Rob Halford back on board. So now we have A Touch Of Evil Live, the first live recording since the reunion. It's a fine, but it's definitely a live album for the new Priest era. 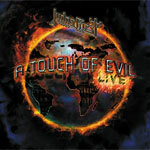 A Touch Of Evil Live, recorded on tour from 2005 and 2008, includes several tunes from Angel Of Retribution as expected, but also includes two songs from Priest's epic Nostradamus, Death and Prophecy. Here, fan expectations probably trembled wondering how much would they play, what they choose and what if any old favorites may be sacrificed for their inclusion. The selections are many and I guess these two are as good as any (with Prophecy being the best) from that lengthy work. However, as a sacrifice or not, several constants and favorites are not included like Breaking The Law, Living After Midnight, or Metal Gods (that's not to say that they were not played during the actual set). Instead, A Touch Of Evil Live seems to represent Judas Priest focusing on their latest accomplishments, but also putting the heavy back into their metal. This is a very intense live album from Priest with the song selections emphasizing their legacy of being true progenitors and kings of traditional heavy metal. Hellrider, Between The Hammer and The Anvil, A Touch Of Evil and the newer Death are decidedly thundering and blistering. Besides the lack old favorites, other notable observations include the fine, almost sterile, production mix, the obvious incongruity in song order, and the minimal amount of Halford banter with the audience. A Touch Of Evil Live, though hardly perfect or displaying the quintessential Judas Priest fans know and love, is still an entertaining portrait of a modern Judas Priest reinjecting the heavy back into their classic heavy metal repertoire. Recommended! A Touch Of Evil Live, though hardly perfect or displaying the quintessential Judas Priest fans know and love, is still an entertaining portrait of a modern Judas Priest reinjecting the heavy back into their classic heavy metal repertoire.